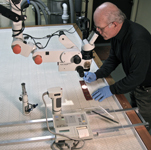 Practical "micro spot" tests are performed on a vacuum table to identify how fabrics and substances will respond to cleaning (below, left). A vacuum pulls all solutions through layers of stainless steel, polypropylene and Reemay screening for complete control. 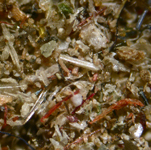 Solutions are applied with dropping needles and dropping bottles and observed under the microscope when necessary. Controlled spotting and cleaning is performed on the vacuum table. 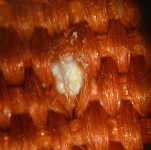 Microscopy assists in identifying the type of fibers and weave - but it is especially useful in determining the nature of soil and whether the soil is adhered to, or absorbed into, the fiber (above, center). The type of dust (percentage of fibers vs. minerals and the type of minerals) gives us information about the soil, age, condition and the previous care of the rug (above, right). Damaged pile - typically from improper cleaning - results in a higher percentage of broken fiber. 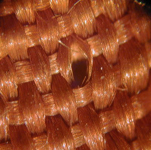 The fibers (above) are metal-wrapped silk threads. 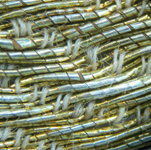 There are several types of gold threads. Asian rugs and textiles often have gold leaf applied to paper or vellum. Wetting can be a risk. Islamic gold is usually applied to a copper or silver foundation and can be immersed. 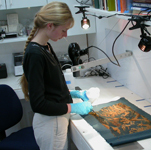 Forensic science tells us whether a rug or textile is authentic, how it was made and used - and to what extent it can be cleaned or repaired (below, left). 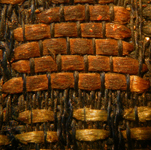 A forensic examination of crystal formation in this early Chinese textile led to a discovery of techniques to remove the crystals (below, center and right). Forensic examination with ultraviolet light can show repairs, dye changes and certain types of soils. 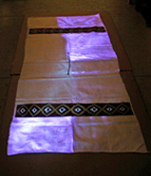 In this case, areas of bleaching and retouching are revealed under the uv illumination (below).